They are available in a variety of different washes and ranging from white jeans to black ones, you can find them all, easily available in stores. Just like their colors, plus sizes, jeans can be found in a variety of different embellishments, ranging from plain regular jeans to pearl adorned ones, studded jeans, jeans with fishnet stocking linings, ripped jeans, and much more. Here is a list of most popular Types of Women Jeans that are forever in fashion. Boot Cut Jeans are the extra long jeans, with a length that comes below your ankles. They are the type of jeans that look flattering on long legs and look elegant when paired with decent sized high heels. If you have thicker legs, boot cut jeans will give a more slimming effect to your legs. Cigarette Jeans are straight cut, fitted jeans that come in a variety of different lengths. They usually range from lengths slightly above your ankle to a mid-calf length. 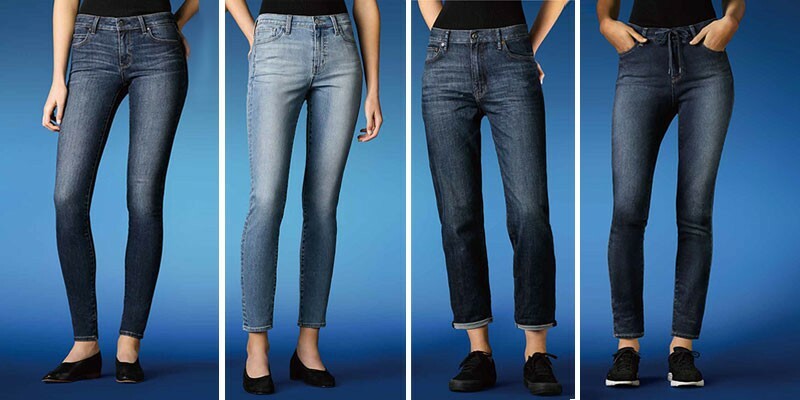 These types of jeans are more flattering on women with shorter heights and slimmer legs since it gives an elongated look to your legs. Flared Jeans have a retro look to them, with a fitted length that flares at the bottom. If you are conscious regarding thick calves, it will give you a more flattering look and these types of jeans look chic with any style of top. Skinny Jeans are the most trending jean silhouette and look flattering on all body shapes. They have an almost ankle-length that gives an elongated look to your legs. These jeans pair well with any type of loose or fitted top. Straight Cut Jeans come in a variety of different lengths and fits. High waisted straight cut jeans look classic and are easy to style with any type of top. These are the universally flattering jeans that look lovely on all body shapes and leg-lengths.